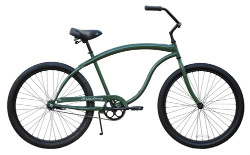 A cruiser bicycle is sort of a forty's retro bike that you see in the park or at the beach. They offer that "classic bicycle" look that a lot of people really like. They typically use 26" low pressure tires and wider and softer saddles. They also have high swept back handlebars to give the rider a more upright riding position which is easier on your back. Although many cruisers are single speed, multiple speed cruisers are becoming much more common. A single speed cruiser is not intended for climbing hills, but may be a good choice for a leisurely ride on flat terrain. I hesitate to recommend a single speed cruiser bike to boomers and seniors since riding it may be a little bit more work than they bargained for and I don't want them to get discouraged. Modern bikes are easy to shift and I would suggest at least three speeds for most boomers. It is much easier to pedal a bike when you have the ability to shift gears to suit the terain and speed requirements. Most cruiser bicycles use standard caliper brakes but some even still use the old style coaster brakes or caliper (hand brakes) on the front and coaster brakes for the rear wheel. There are still a lot of folks that prefer the old style coaster brakes that they knew as children.